Trade and employment laws which give women greater access to the economy across East Africa, can pave the way for more inclusive development and prosperity, according to a new report from the United Nations trade body. Crediting improved education, employment and other key areas, the United Nations Conference for Trade and Development (UNCTAD) said on Wednesday that East African countries can put better policies in place to address gender inequalities and bring women further into the workforce. In its new report, East African Community Regional Integration: Trade and Gender Implications, UNCTAD analyses the impact of regional integration on women's employment and quality of life in the five East African Community (EAC) countries of Burundi, Kenya, Rwanda, United Republic of Tanzania and Uganda — the sixth, South Sudan, joined in 2016. One key recommendation is to close the education gender gap and improve skills training so women can compete more for higher-paying jobs. Another is to create a regional credit mechanism to support women entrepreneurs. Gender chapters could also be included in future free-trade agreements, along with uniform monitoring of how the important 2017 EAC Gender Equality and Development Bill is being put into practice. “This new analysis is another UNCTAD contribution to the debate on how we, together, can make trade policy more gender-sensitive, and pave the way for more inclusive prosperity that leaves no one behind,” Mr. Kituyi explained. Although the economy has already shifted away from farming towards services, and to a lesser extent, industry, 96 per cent of women in Burundi, 76 per cent in Kenya, 84 per cent in Rwanda, 71 per cent in Tanzania and 77 per cent in Uganda still work in agriculture. Women also shoulder a higher share of unpaid care work, which, in turn, limits their availability and flexibility to do paid work. And despite equal property rights, says the report, women’s land ownership remains low in many countries: just 35 per cent in Kenya and Uganda own their own land, and 46 per cent in Rwanda. Based on the report’s findings, UNCTAD has also released a document designed to benefit women in the region, called Advocating for gender-sensitive trade policymaking in the East African Community. The research was funded by the Netherlands through TradeMark East Africa and conducted by UNCTAD’s Trade, Gender and Development Programme. 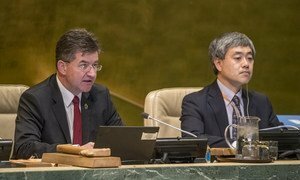 Addressing the final event of this year’s Africa Week at the United Nations, General Assembly President Miroslav Lajcak on Friday highlighted the continent’s transformative changes driven by the African Union’s development agency.